It’s that easy–just one click and you are on your way! In today’s fast paced society you need to be able to conduct your business on the go, and that’s exactly what our mobile app does for you! When you download our app, you will have access to all of your account information in a few clicks. You can view your account balances, view account transactions and transfer funds between accounts and loans. You can also be sure that all of your information is safe and secure. All you need to get started is an active WCU account and the app downloaded from the App Store or Google Play. Need a little extra help when it comes to saving up money for Christmas or that awesome vacation you are planning? With our Christmas Club and Vacation Club funds, you can be on your way! Set up a savings fund for Christmas or vacations and have a designated amount automatically taken from your checking account each month and put into a savings account. You don’t even have to think about it. Then, when it comes time to spend the money, you have an account full of dollars that you have saved over the entire year! It’s simple to get started, just call any WCU office and watch the savings pile up! If you travel much, you might want to take advantage of our participation in Co-op Shared Branching. Shared Branching is done through a network of like-minded credit unions all over the country. 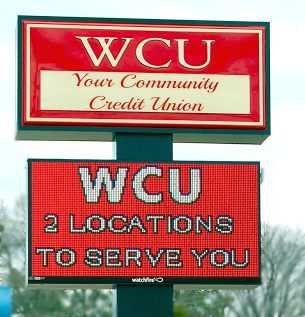 If you are out of the WCU area and you need to conduct credit union business, you can just stop by a participating credit union near where you are and they can pull up your account so that you can deposit, withdraw or transfer funds. All you need is your identification and your account numbers! With Shared Branching, wherever you go, WCU has your back. So that’s how WCU is going to make your life a little easier in 2019! If you have any questions or want more information on any of these programs, please call our main office at 256-355-5010, and we will be able to help you get started. If you have ever tried to start sticking strictly to a budget, you know you will do anything to save money. Many people use coupons as a way of keeping their grocery and household item budget in check. 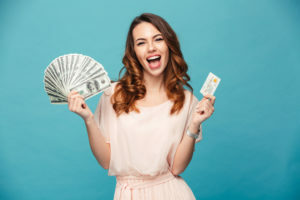 Coupons can be a great addition to a frugal lifestyle, but when you become too infatuated with getting the best deal, sometimes you end up spending more than you think. Here are some tips to use coupons effectively with your budget. This is a question you should ask yourself before you load up your cart with the great deal you got with coupons. Only cut coupons for items that you will actually use instead of just buying it just to get a deal. You are actually spending more money on a great deal with an item you don’t really need than you would without the coupon, because if you didn’t have the coupon, you wouldn’t have bought it at all! Take time to think this over each time you want to use a coupon. 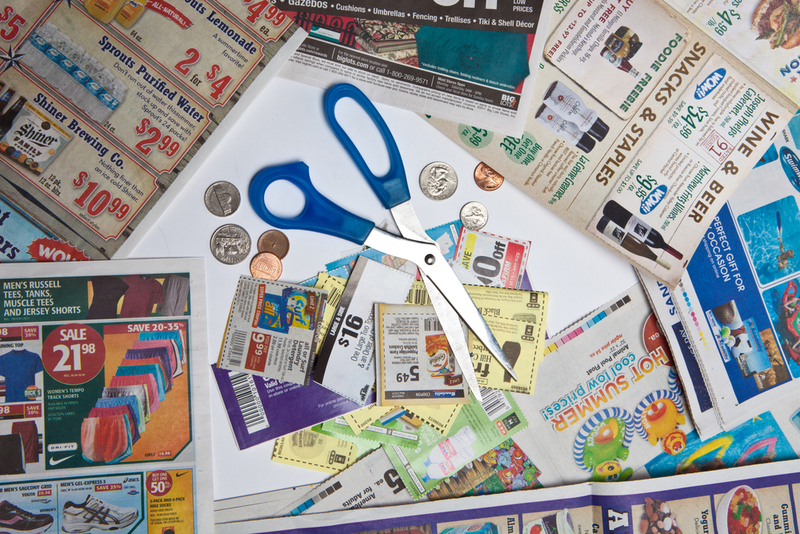 Avid coupon users can spend lots of time cutting out coupons from the newspaper inserts and magazines. Sometimes, for the extreme couponers, it can take as much time as a full-time job. If taking the time to cut out each coupon is becoming a burden on your daily routine, try looking for stores that offer digital coupons. Many grocery stores offer manufacturer’s coupons on special apps and with rewards cards. You can even use third party apps like Ibotta to get cash back after your transaction. Downloading digital coupons can drastically cut down your coupon cutting time. With anything in life, you need to practice balance with coupons. Like we mentioned above, only buy the items you need, shop the sales and focus on saving money for your budget. The goal is not to buy out the “deal of the week” at the grocery store. Get as much as you need, and leave some sales for the rest of the shoppers. Used effectively, coupons can be a great resource for your budget. Just make sure you don’t get too crazy and let getting the next big deal consume your life. As 2019 rapidly approaches, it’s time to start thinking about your financial future. What would you like to achieve financially in the upcoming year? At first, that seems like a silly question–most people just want to make more and save more. However, you might find broad goals like “make more money” to not be very effective when it comes to actually accomplishing them. If you take the time now to sit down and write out really specific financial goals, it might help you focus on what actually needs to be done instead of just hoping it will happen. 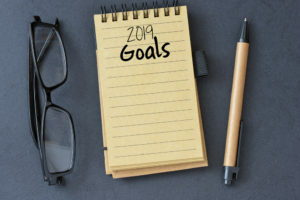 Here are some specific goals that tend to be popular when thinking about the new year. Instead of just having your goal be “save more to my retirement,” think about how much you would like to save. If you currently only save 2% of your paycheck to retirement, then make it your goal to save 5% in 2019. If you would rather do your goal in terms of amount, make it a specific dollar amount you want to save like $2000 or $5000. Whatever you do, just make sure that your goal is an improvement upon the past year. It doesn’t even have to be a huge goal, just something better than this year that you feel you could accomplish in the new year. Much like saving more to your retirement fund, a goal of simply saving more probably won’t motivate you to actually save more in 2019. You need to make a specific goal of how much exactly you would like to save next year. Again, make it your goal to have the amount be bigger than you did the previous year. If you saved $2000 this year, make next year’s goal to save $3000. It doesn’t have to be a large amount, just as long as you actually have a specific goal to work towards. Having a real number to work towards will be more motivating and help you reach your goal quicker. Maybe some of you don’t even have a budget–if that’s the case, that should be your number one goal of the year. But instead of just saying, “I want to start a budget,” make it your goal to start and stick to your budget each month. Yes, some months may get away from you, but if you have it your goal to stick to it each month vs. just having a budget in general, you will be more likely to utilize that budget more efficiently. Many people list tackling debt as their number one financial goal in the new year. That’s great! However, instead of just saying you are going to “tackle debt” make very specific ways you are going to do so. For instance, your goal can be, “I am going to reduce my debt by $____ amount.” Or, your goal can be paying off a specific credit card, reducing your student loans by a certain amount, or even just sticking to the debt snowball method. With debt repayment, the more specific the goal, the more likely you are to succeed. Whatever your financial goals are in the new year, it’s important to make sure that you have a detailed plan for achieving these goals. The more detailed the action plan, the better. Without a plan, you will find that you won’t have much success with your goals–even if you are extremely motivated to complete them. So make your plans before the new year begins and you will be well on your way to having a successful 2019! As the holidays quickly approach us, it’s time to take a look at our finances and holiday spending. One of the ways you can be sure to have a stress-free holiday is to not go into debt buying Christmas gifts. If you don’t have the money to buy gifts this year, you shouldn’t charge things on your credit cards just to have something to give. However, with the right planning, you can stay debt-free and give your loved ones something special for the holidays. Here are a few tips that will help you have a debt-free Christmas. As with most tips to staying debt free, the first thing you must do is make a plan. Figure up how much money you will need for gifts, events and food this holiday season. Write down that total amount and divide it by twelve. The total is the amount of money you need to save each month to meet your budget by Christmas. If you start to plan for the holiday season in January, you won’t have to stress about not having enough money at the end of the year, which is a contributing factor for debt. If you find yourself in the situation where you didn’t plan ahead and money is tight, then consider hand-making your gifts instead of going out and spending a bunch of money. The act of giving gifts during the holiday season is just to show your loved ones that you care about them. This can be done through inexpensive homemade gifts like baked goods or crafts. Remember it’s the thought that counts. Check out Pinterest for some homemade gift ideas. If crafting isn’t for you, don’t worry! There are ways to make some extra cash if you need money for gifts. The easiest way to do this is to sell items you no longer want on platforms such as Ebay, Craigslist, Letgo and Facebook Marketplace. You can sell old clothes, books, electronics, kitchen appliances, baby items, etc…there’s a market for most items in your home. Selling those items will give you enough cash to buy gifts if you find yourself in a bind at Christmas. If you use credit cards for any reason (like gaining rewards points for purchases), it’s important that you always pay off your cards completely when the bill is due. If you don’t, you will be incurring interest, which will end up costing you a lot of money in the long run if left unattended. If you pay off your cards in full, you won’t have to worry about outstanding debt. 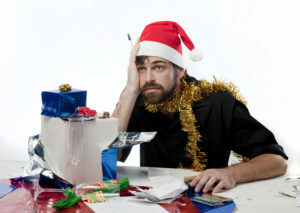 These are just a few ideas of ways you can stay out of debt during the holiday season. Check out some of our other blog posts in the archives for more debt management tips. On this blog we have talked about the dangers and pitfalls of credit cards, however not all credit card usage is bad. If you are the type of person that can use self-discipline with credit cards, then it might be beneficial for your finances to consider cards that give rewards back just for using them. Not all rewards credit cards are the same, so if you are interested in making credit card rewards work for your budget, there are a few things to consider. When you start to look at all the rewards cards that are available, it’s easy to get overwhelmed. These days you can probably find any kind of rewards you want. There’s cards that offer cash back, air miles, gift cards, free cruises and more! Doing research and figuring out what kind of rewards you are interested in before applying for the card is best. Don’t apply for a card with air mile rewards if you never travel. If cruises are your choice of vacation, then apply for a card that lets you build points towards free trips. The point is, find a card that fits your lifestyle. For most people, the rewards card that works the best is always one that offers cash back. This type of card is especially good for those who are on budgets and need a little wiggle room. You can find cards with up to 5% cash back on certain purchases. Little by little all those purchases will add up to a nice little bonus check when you cash them in. Again, do your research and find a card that fits your needs and will give you the most bang for your buck in terms of cash back points. To get the most out of your rewards card, you will need to run all your spending through that one card. This is where the self-discipline part comes in–you will have to pay off the balance every month in full. This way you will avoid interest charges, and you will rack up points fast to get the most rewards. Use the card for every purchase you make, just like you were using your checking account. Just make sure you keep immaculate records so that you won’t overspend and not be able to pay if off the next month. This is the fastest way to get the most rewards. When you use a rewards credit card as your main tool of purchasing, you will need to make sure that you keep track of absolutely everything. Not only do you have to keep track of your spending, but it is important to keep track of any changes to your credit cards terms and conditions or how long you have until your rewards points expire. The rules are different for different cards, so you need to read the fine print and know exactly what you are getting into and keep track of any changes you see. Using credit cards to gain rewards can be a very nice addition to your income if you play the game properly. Following these tips should get you started off on the right foot.